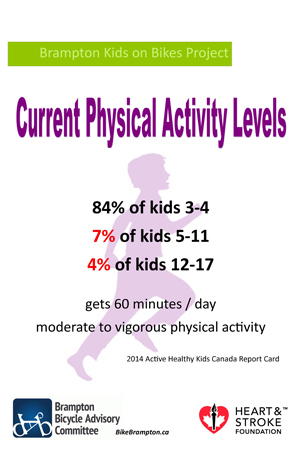 encourage active transportation for health and academic benefits. Parents and children are urged to travel safely to and from school. These videos are the result of a partnership amongst Peel District School Board, Dufferin-Peel Catholic District School Board, Peel Region Police, Region of Peel, City of Brampton, City of Mississauga, Brampton School Traffic Safety Council, Safe City Mississauga, IBC/BAC, CAA and Bike Brampton to encourage active transportation for kids. 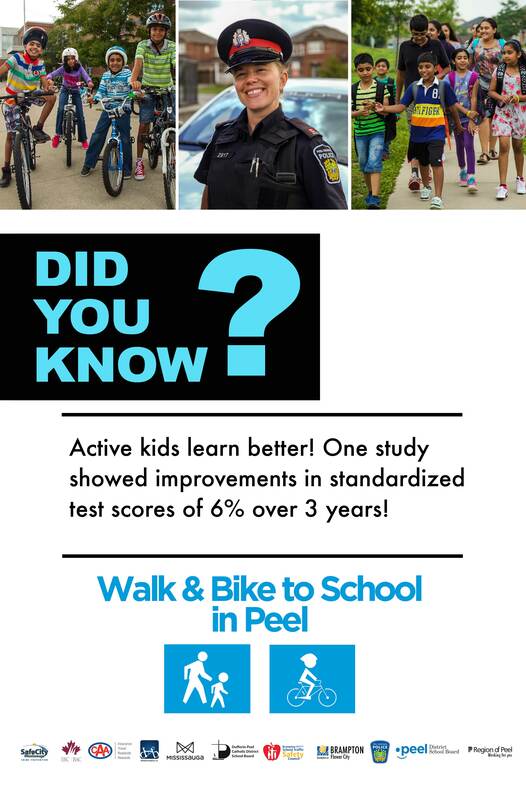 Walk & Bike to School in Peel – Get Fit! Bike Brampton has been thrilled to participate in this excellent example of cooperation and partnership work to bring these important messages of health, safety and academics to the parents and children of Peel and beyond! Please share widely and frequently! We want to see children travelling actively! Peel school walk & bike! Brampton Kids on Bikes Project research, which was funded by a grant from Heart & Stroke Foundation and volunteers from BikeBrampton, has led to the conclusion that Peel needs to move from TRANSACTIONAL CHANGE to TRANSFORMATIONAL CHANGE.